Posting here rather than PM because maybe someone is lurking. @Harryc , are you buying a pass for Americade? I see they've got them for $69 to $139 but I don't know if any of them are worth the money. Plus: What time does it usually wrap up on Saturday? 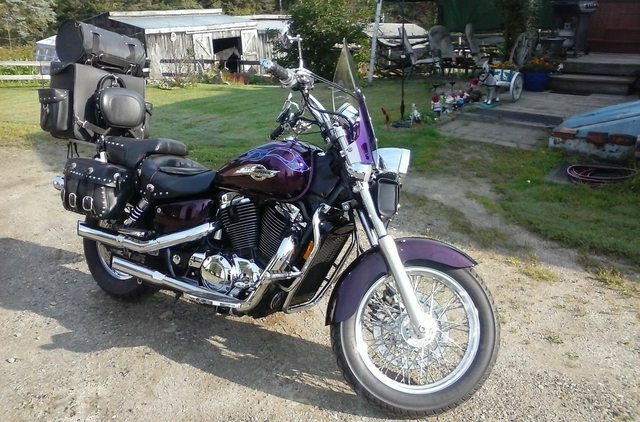 I've got no definite destination until the 14th so I plan on cruising around New England but need to figure out if I'm even going into Lake George on the last day. The actual Event starts to shut down around noon on Saturday. I don't buy a full pass because I'll only go one time and pay at the door. The rest of the time we're either riding or doing other things. Yea I have been lurking here as I am only about 2hrs. away. The only interest I seem to have in Americade would be to meet up with some fellow HSN members for whatever wherever decided. That said the wife and I rode last Sunday and passed the turn (three of them actually) to Shushan which is only about an hour from home. Anyway if this is something you folks would like to do maybe we can get together. The only interest I seem to have in Americade would be to meet up with some fellow HSN members for whatever wherever decided. Harryc and I are planning to meet there on the 9th. Probably in the parking lot at Scotty's but that's tbd. I'll be staying in Glen Falls because Scotty's wouldn't let me book only 3 nights. Won't be going to Shushan until the 19th due to scheduling issues so I'm planning to wander around New England for a week. Only definite stops on the itinerary are in Connecticut: Naugatuck (on the 14th? ), Milford (the next two days?) and Simsbury (17th & 18th). The rest I'll figure out as I go. Vermont will be a definite; despite growing up in New England I've never set a foot down in VT. Been through it more times than I could count but always inside a car. Not sure if New Hampshire is any different. As Art said Bill, we plan to meet on the 9th, but I will be in Lake George the 8th evening thru the 11th, leaving on the 12th. If you can't get a day off during the week, maybe Saturday the 11th we could meet. You'd have to be specific as to time and date because I will be on vacation with a group of people and you know how that goes. It would be good to shake your hand though. Even if Lake George is out for you, we'll definitely meet halfway this season like planned for last year but didn't happen. I'll make it a point to get there this time ... just pick a weekend day and time that's good for you. There are only a couple of weekends this season where I would not be available. Last edited by Harryc; 04-22-2016 at 09:20 AM. Vermont will be a definite; despite growing up in New England I've never set a foot down in VT. Been through it more times than I could count but always inside a car. You'd love VT Art. Some great riding up along route 7 and along Lake Champlain. Bill could probably give you a short list of the best rides. Lake Champlain is specatcular. You have the VT farmlands on one side and look across the Lake at the Adirondacks. There's lots of mountain riding also in the interior. Last edited by Harryc; 04-22-2016 at 09:26 AM. Hopefully we can put something together. I have 3 weeks and 3 days vacation time that can be pretty flexible since it is the off season. I would like to meet up,and if Art is touring in Vt. maybe something could be put together there as well. Any plans yet Bill?. I will be in Lake George from the 8th thru 11th. Come on over for a ride and a meal. My friends are good people so bring the wife, no worries. If not, I'd like to meet you this summer to shake a hand, so pick a day. Last edited by Harryc; 05-23-2016 at 09:15 PM. As I said I am pretty flexible knowing others are coming a fair distance and probably have an agenda of things they want to do. and maybe a few days the at beginning of the following week. I will send a PM tomorrow evening. Anyone other than me committing to come from a long way off? My original plan (visiting nearby relatives right after Americade) did not work out at all. Now I'll be at their place (in Shushan, NY) the following weekend and kind of aimlessly wandering (Isn't that the best kind?) around New England until the 14th. (That's when I'll be stopping for the night in Naugatuck, CT to visit relatives. On to the shoreline after that for more relatives before heading back inland.) Have to be in Virginia on the 21st through 25th, heading home on the 26th.